The Impossible Knife of Memory reflects on how Post Traumatic Stress Disorder impacts an entire home. Homeschooled teen Hayley Kincain has spent the last five years on the road with her father, a veteran suffering from PTSD after his experiences in Iraq and Afghanistan. They’ve now returned to his hometown to attempt a “normal” life, but death constantly haunts him. Instead of attempting rehabilitation, her father spirals out of control, relying on drugs and alcohol to numb the pain of his bloody past. This forces Haley to assume the role of parent amidst the incredible struggle of everyday teenage life. Hayley narrates her struggle with parenting her parent, but we do receive occasional glimpses into her father’s mind. These moments reveal the painful war experiences that constantly grab ahold of his mind and pull him away from his daughter and his life. To be honest, the abrupt shifts into these memories caught me off guard and left me confused at first, but that confusion only lasted about 7 seconds. These perspective shifts are so powerful; the likeness in the way the two characters see and hide from the world is beautiful, yet terrifying. There’s a lot to love about this book. First, Anderson’s writing style is incredible. Her words are honest, emotional, and gritty, but they’re also simple; the drama never feels overworked. Second, every character carries emotional burdens. I’m sometimes annoyed with “problem” novels and movies where the protagonist is the only character visibly suffering through so much drama while everyone else leads picture perfect lives. The Impossible Knife of Memory is more realistic in portraying everyone with their demons. Not only does Haley face her father’s PTSD, but secondary characters face bitter divorce, addictions, rehab, and more. Third, the adorkable flirty quips from potential love interest, Finn. They got to me hard and brought out all the feels. For me, teen romance of any kind usually makes for a cringeworthy reading experience, but when it’s well-written, I get all giddy and feel like I’m in an episode of Gilmore Girls. 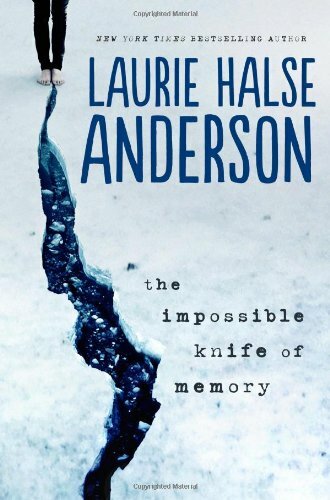 So while The Impossible Knife of Memory is certainly a serious novel, these lighter elements guide the reader through the grittiness and bring shades of hope and happiness to Haley’s difficult life. Finally, my absolute FAVORITE thing about this novel is the fact that the high schoolers have lunch during first period. Seriously, Anderson just completely understands the teenage experience. I will never forget how my class had lunch at 10:35am. That is not lunch. That is brunch. By the time I reached the last few pages of this book, I was holding it about two inches away from my face because I was just THAT absorbed by it. I highly, highly recommend picking up this book.